We practice agriculture “raisonée” in all of vineyards, only treating our vines where absolutely necessary, in order to maximize the terroir (clay-limestone) characteristics of our wines. We use organic compost which is only applied when soil deficiencies are revealed, following analysis of the soil and vine vegetation. When climatic conditions dictate we use organically permitted treatments (sulphur and copper) to protect the vines from mildew and oidium. The grapes are harvested by hand and with the best grapes selected on a sorting table in the vineyard. - Fermentation temperature : 20°C. - Fortification (“Mutage”) : When the sugar density has reduced to 1040, 96% pure alcohol (derived from grapes skins) equivalent to 10% of the vat volume, is added to stop the fermentation. - Sugar density after fortification : 100 gr. per litre. 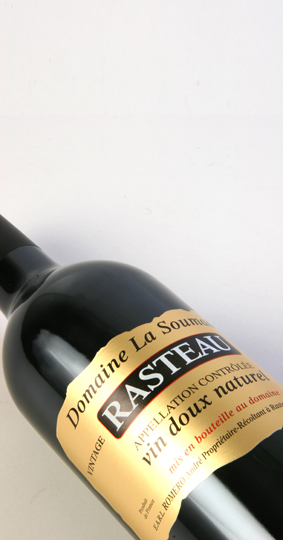 - Grape varieties : 100% Grenache noir. 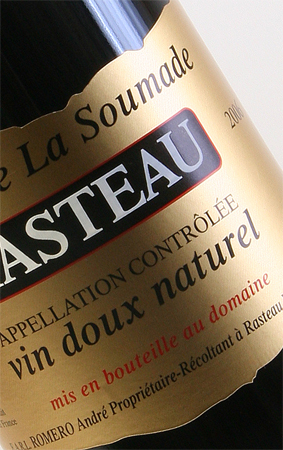 - Ideal serving temperature : 10° C.
Winemaking consultant : Stéphane Derenoncourt. - Traditional winemaking with punching down of the skin cap and a regular pumping over of juice in open stainless steel tanks. - Maceration of the skins lasts between 18 and 25 days. - Fermentation temperature : 25° C. to 30° C.
- Sugar density after fortification : 100gr. per litre. - Filtration and fining to avoid the deposit of coloured materials. - Age of vines: 40 to 80years. - Food matching : As an aperitif or with chocolate desserts or Roquefort. - Ideal serving temperature : 10 to 13° C.